There is no doubt that automation and AI will continue to impact the financial industry in the coming years. But as I read about Wells Fargo using AI to rate stocks, three things came to mind that bring to light the benefits and the challenges of automating the research process. First, what makes the AI analyst unique is its willingness to go negative on a stock. Sell side ratings have always had (and arguably always will have) a positive bias. In the days of unbundled research, this is no longer potentially due to banking relationships, but more just due to human nature. You see, there are few things more painful than having a sell rating on a stock that lots of investors and own and love. Not a popular point of view. But being bullish on a stock people own and love? Now that is a popular proposition. The AI bot doesn't care what people think, which allows it to be bullish or bearish regardless of perceived impact on relationships down the road. Charts can provide a similar emotionless process. When a chart goes from bullish to bearish, it can almost jump off the page for you. 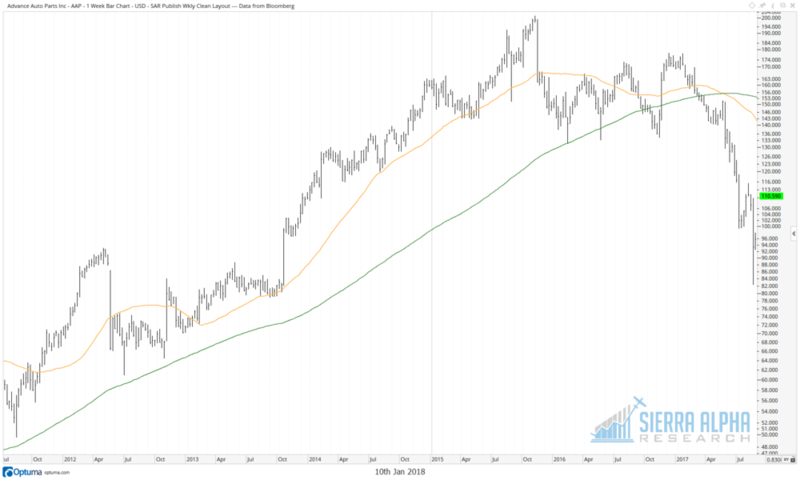 For example, take this chart of Advance Auto Parts (AAP). After a consistent uptrend from 2012-2015, it entered a consolidation period in 2016 then a distribution period in 2017. At which point would that transition become painfully obvious? When you had a Dow Theory downtrend of lower lows and lower highs? When it broke through a significant support level? When it broke down through long-term moving averages? As legendary technical analyst John Mendelson once put it, "I like signals that you don't need your glasses to see." Second, the AI here is based on text analytics which has become a common application of machine learning in the financial industry. In this case, the bot was analyzing news stories to try and detect patterns. Of course, something like this relies on a steady stream of news stories. This becomes a challenge with smaller, less liquid stocks, especially those in emerging markets where news flow is less frequent. And that is precisely where stock analysts stand to add the most value! Coincidentally, this is also where technical analysis can provide a key advantage. Even where news flow is light, prices are still set by supply and demand, fear and greed. The behavioral biases that cause price movements are universal, and screening for technical signals across the equity universe can often help you uncover hidden gems in unlikely places. Finally, this story reminds me of our unique ability as humans to empathize. In a world of roboadvisors and quantitative strategies and automation, people still want a person to break the bad news and help them feel better. Just like people would much rather get a challenging health diagnosis from a doctor than a machine, clients will be looking for sympathy and reassurance if and when the markets take a downturn. I believe that the most successful financial professionals will be those that are able to take advantage of the strengths of AI and automation, but are also able to connect with clients in meaningful ways to help them make sense of the markets.